McArthur’s Warehouse, Gas Ferry Road – the image is a view of the scheme from looking northwest along Gas Ferry Road towards Great Western House. Update: On the 29th November 2017 Councillors approved the planning application. The Society supported the redevelopment but joined Historic England and the Bristol Urban Design Forum in their criticism of the height of the scheme in the Harbour Conservation Area and next to the Great Britain. Although the provision of affordable housing is not policy compliant, Officers recommended approval based on the planning balance. 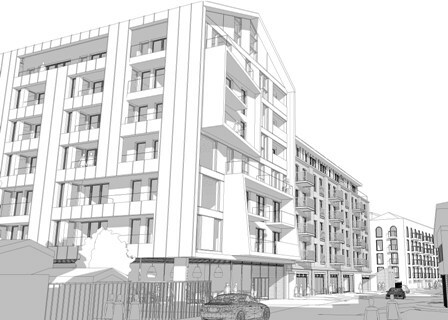 They said that whilst a reduction in scale may be desirable it would adversely affect the viability of the scheme, and the affordable housing provision. Officers recognised that the application would result in some harm, to designated heritage assets, they considered that the benefits of the scheme would outweigh that harm subject to a section 106 agreement to secure the affordable housing. The Guinness Partnership have applied for planning permission to demolish the former malthouse to construct about 150 flats with flexible ground floor level commercial uses. The Nash Partnership are the architects. The Society strongly supports redevelopment to bring this site back into economic use and reluctantly accepts demolition of the locally listed, former malthouse, which is now in a dangerous state. The Society shares the concern of others about the protection of employment uses around the dry dock. The Society supports the heritage objection of Historic England and the Bristol Urban Design Forum to the height of the Block A that faces Gas Ferry Road and Block B that faces the Avon New Cut. These buildings would draw too much attention to the themselves. The surrounding buildings should be a backdrop to the SS Great Britain, which is the area’s centre of attraction. The development should be more subservient to maintain the drama of the approach to the setting of the ship. Block B would face south and dominate the view from Coronation Road. The standing seam zinc cladding would be a large dark mass and overwhelm Rolt Boat Builders yard at its feet. The Society supports the reduction of these buildings from 7 to 6-floors. The Society welcomes the ground floor commercial and café uses that will bring activity to the surrounding area and potentially animate the route past Rolt’s Boathouse and amenity to the future residents. This part of the Harbour Promenade is currently neglected and derelict. Development will bring a major planning gain to the Harbour Promenade. Unfortunately, The Society joins Historic England as an objector to the scheme in its current form. Bristol Civic Society’s response [PDF, 582KB] and the Bristol Civic Society’s supplementary response [PDF, 485KB]. Right-click to download, click to view.